The Razer BlackWidow has been unveiled, billed as the first mechanical gaming keyboard engineered for gamers. Razer's peripherals have been popular with gamers for a long time and the US company is keen to build on that with a number of recent announcements. The latest arrival for Razer is the BlackWidow keyboard, which was shown off at GamesCom in Cologne and is the product of three years' design work. 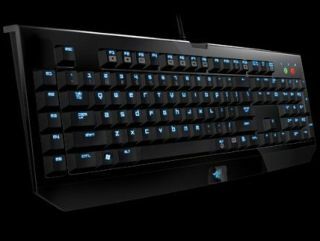 "Most mechanical keyboards in the market today are standard mechanical keyboards rebadged as gaming keyboards that feature stiff keys that cause key actuation fatigue," explains Razer's release. "Such keyboards are inherently worse off for gamers as it actually decreases gameplay performance as opposed to enhancing it. "As a result, most professional gamers eschew such marketing gimmicks for regular membrane keyboards." So, essentially, it's easier to press the button and makes sure your fingers don't get worn out. "The Razer BlackWidow is the world's first mechanical keyboard that has been engineered from the ground up for gaming," said Robert "Razerguy" Krakoff, president, Razer. "Imagine every single key on the keyboard with the precision of a mouse click – no more pressing of keys without knowing for certain if they have been actuated. "Precision clicking coupled with an optimised lighter key actuation force, this changes the way gamers will play from now on. " The Razer BlackWidow has a UK release date set as September, and will be priced at around £66. There will also be a Razer BlackWidow Ultimate priced at £107. "Also available in the same month is the Razer BlackWidow Ultimate, a step up from the original edition with the added features of individually backlit keys with 5 levels of lighting, 3.5" audio and microphone out jacks as well as an additional USB port."